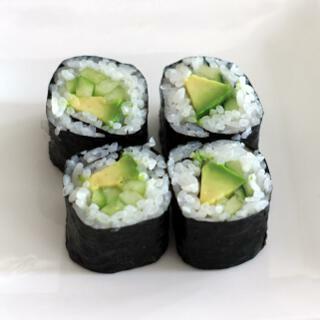 Avocado sushi rolls are a staple of the American sushi scene and can be found at many sushi bars and restaurants alike. However, you don’t have to go out to enjoy this delectable dish; you can make it yourself by following these simple instructions. Avocados are rich in healthy fats and are a delicious combination to your sushi whether you make it with just avocados or add it in with other ingredients. In our sushi calories table, the entire avocado roll is listed as 140 calories with 6 grams of fat, 28 grams of carbs, and 2 grams of protein. 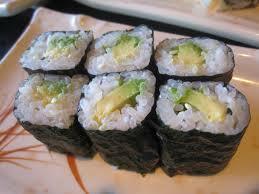 To make a regular avocado roll you will need 1 1/2 cups of sushi rice. You must use sushi rice as regular long grain rice is not sticky enough due to having less starch. Sushi rice is seasoned with 1 tablespoon of rice vinegar, 1/2 tablespoon of sugar, and about a pinch of salt. You will need 1-2 ripe avocados. Make sure they are ripe. If the avocado feels very hard, it is not ready. If it feels too soft, it is over ripe. Lastly you will need some nori (seaweed). Find out more about these ingredients on our Is Sushi Healthy? page. Step 1: Making your rice: Put your rice in a large bowl and run cold water over it while stirring it with your hands. Do this until the water coming out of the bowl is clear and free of any white dust from the rice. Drain the bowl completely. Step 2: Cooking the rice: Put your rice in a pot and fill with water. Put the pot under high heat until the water is boiling, then turn the heat down to medium. Once the water is almost completely evaporated, turn off the heat and leave the rice to cook in the remaining heat for approximately 20 minutes. Of course you can save yourself all the trouble and purchase a rice cooker! Step 3: Make the seasoning mix and heat the rice vinegar, sugar and salt until the sugar is completely dissolved. Step 4: Seasoning the rice: Put the rice in your bowl and gradually add the seasoning by folding it into the rice with a wooden spoon. It may be helpful to periodically wet the spoon to prevent the rice from sticking. Step 5: Roll the sushi: Prep your bamboo mat by wrapping it in plastic wrap, this will keep the rice from sticking to it. Then, place half-sheets of seaweed across the mat and gentle spread rice across it, covering about 2/3 of the surface. (Wetting your hands or spoon may prevent the rice from sticking). Cut long, thin slices of avocado and lay it along your mat horizontally. Then slowly begin to roll the mat up, keeping gentle pressure on the center of the rice to prevent it from moving. Step 6: Cut the roll: Once you have your roll nice and tight, remove it from your mat and cut slices about 3 quarters of an inch thick and serve with soy sauce and wasabi. Remember, if at first you don’t succeed, keep practicing. Sushi can be a difficult dish to make, but if done properly, can make you a favorite of your friends and family.